Over the past month a wave of violence erupted in the streets of Caracas and other parts of Venezuela, transforming a pacific student protest into an intense clash between the National Guard and the government opposition forces. Demonstrations began in early February in Venezuela’s state of Tachira and hit the headlines when students from Caracas began to protest against increased violence, high inflation, poverty, and censorship, all leading to calls for President Nicolás Maduro to step down. The reaction of the government was swift and disproportionate; students were killed and some went missing[i], apprehensively recalling the Argentinian desaparecidos. This response triggered backlash from a large amount of the population who, supported by the political opponents of Maduro, gathered in the streets to challenge the authorities. 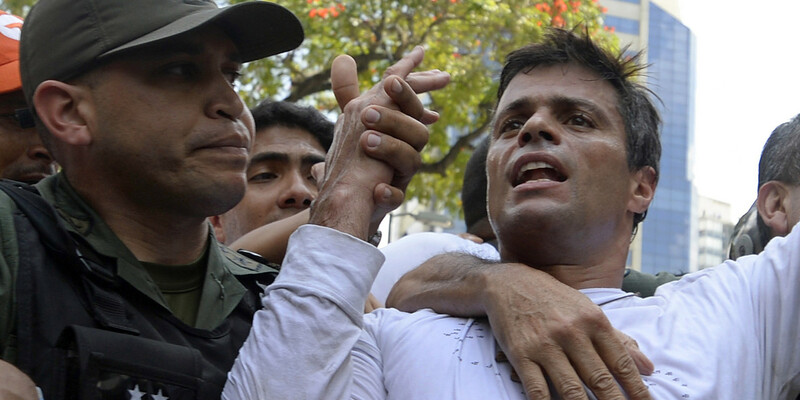 There are many leaders on the revolutionary side, however the one person most feared by Nicolás Maduro is the former mayor of Caracas’s Chacao District, Leopoldo Lopez. Lopez is not a new character in Venezuelan politics and he has been a thorn in the government’s side for a long time[ii]. For some time, Lopez has represented the anti-Chavism movement, the original Venezuelan socialism. Born into a rich family involved in the oil and gas industry, Lopez studied in the US where he obtained a Masters in Political Science at Harvard’s Kennedy School and a PhD Honoris Causa in Law from Kenyon University, Ohio. In 2007 and 2008 he won the Transparency International’s prize for his work in Chacao that, under his direction, became the most transparent and efficient municipality of Venezuela[iii]. His political strategy is built upon pacific demonstrations, inspiring and passionate speeches, white flowers in National Guards’ guns, twitter hashtags, and practices of nonviolent resistance. He is the fresh and young face of the opposition: at 42 years old he is the rebel who, by using new media and through bypassing censorship, speaks to the new generations of Venezuelans. 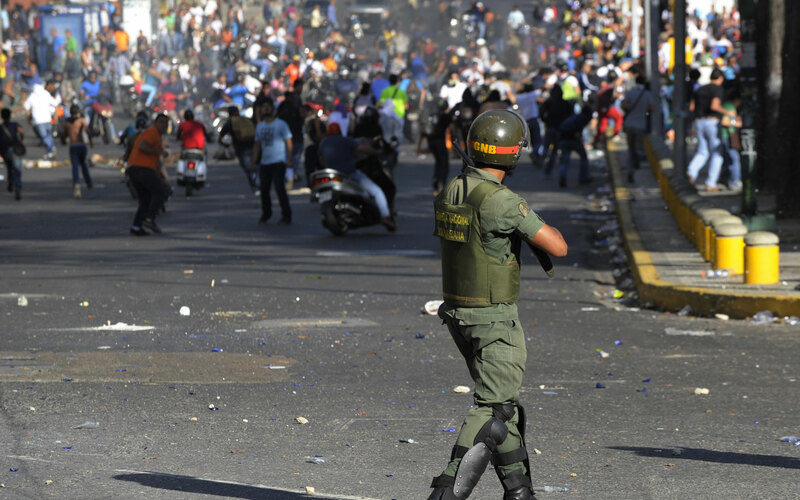 The government accused Lopez of inciting violence during the protests; more specifically the opposition leader was held responsible for the outcome of the protest on the 12th of February, when three people were shot dead[iv]. Lopez was jailed on the 18th of February when, after taking part in a peaceful march, he handed himself over to the Venezuelan National Guard. He did this in front of thousands of supporters, holding white flowers in one hand and the Venezuelan flag in the other while at the same time wearing a shirt with a clear message: “El que se cansa, pierde” (Who gets tired, lose/ Who gives up, lose)[v]. While Lopez is still incarcerated, the protests do not seem to be waning in strength. Maduro recently ordered the army to clean and occupy a key area for protests in Caracas, Altamira Square. One thousand National Guard officers were called to intervene and, by Monday morning, the zone was entirely militarized. Nevertheless, this massive seizure did not stop the protesters as they arrived once again to peacefully voice their disappointment in a moment of extreme insecurity for Venezuela[vi]. After Lopez decided to hand himself over to the police like a martyr of the revolution, his wife, Lilian Tintori, took his place in the streets and squares as leader of the rallies. However, before Lopez’s incarceration, Henrique Capriles represented the head of the opposition. Capriles was the direct opponent of Maduro during the last election and after his defeat at the polls he stepped aside as leader of the opposition. Urged on by the “Lopez affair”, Capriles only began to support the protests on the 16th of February when, with a blog post named “The pathway is long, but sure”, he officially condemned the violence[vii]. Still, Capriles is not Lopez. Capriles is well known for his good relationship with the President, for his numerous pictures with Maduro and for his ineffective leadership of the opposition. In the abovementioned post he calls the Venezuelan president “Nicolás”, invoking a dialogue with his competitor and friend: Capriles is talking to Maduro, not to the people. The gap between the communication strategies of Lopez and Capriles is significant. When in April 2013 Lopez called for people to go to protest, to invade the squares and boulevards to ask for a better future for Venezuela, Capriles was more absorbed in his own struggle against the local tribunals that refused to recognize gerrymandering during the elections. When Lopez was joining the people in the streets, Capriles was trying to convince his friend Maduro to accept a common agenda. On the 18th of March, Venezuela’s Congress requested a criminal investigation into María Corina Machado, one of the directors of the rallies and a precious ally of Lopez. For that, she lost her sit as representative at the National Assembly of Venezuela. Machado, like Lopez, has been accused of several offences, including inciting a civil war[ix], and, like her partner, she’s risking the arrest by the authorities. However, Machado declared that she is not going to follow Lopez’s example and she will not hand herself to the police. “We all know what’s the nature of the regime that there’s in Venezuela. But we’re determined to fight”[x]. María Corina is a strong-willed woman, highly educated, with a long political career and her message to the world is clear: I’m not giving up. Founder of different humanitarian organizations[xi], Machado is extremely popular and may be for this reason that Leopoldo Lopez chose her as an ally. The martyr and the fighter, the magnetic maverick and the passionate amazon; the couple Lopez-Machado is a war machine, ready to use their best shots against the other “less appealing” couple of Venezuelan politics: Maduro-Capriles. 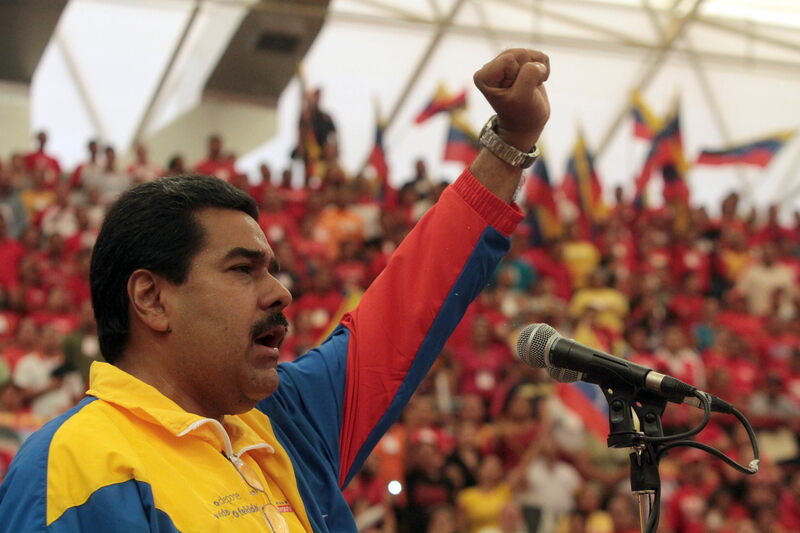 Aside from this game of power in the opposition, there is the government and its leader, Nicolás Maduro. From that moment on every step in Maduro’s political and private life (he’s married with one of Chavez’s lawyers)[xiii] were strictly connected to the Socialist Party leader. In this picture it is made clear how Maduro cannot betray his mentor and idol, and the memory of such great lider, trying to become himself a new and better version of Chávez. Nicolás Maduro does not have the typical connotation of a chieftain and the Socialist Party is aware of it: the President was elected because he was one of the last wills of Chávez[xiv], and not because of his leadership potential. On a typical day in a typical dictatorship the lack of certain qualities in Maduro would not represent a problem, however in these weeks of protests and violence the absence of a strong leader is damaging the government. The demonstrations are on-going and people are continuing to protest without rest and still voicing their disappointment day after day. There is no sure ending to what is happening in Caracas, and it will probably take a long while before we will be able to determine what the future of Venezuela will hold. [ii]Irene Caselli, Leopoldo Lopez: Venezuela’s Maverick Opposition Leader, BBC News, 19/2/2014, http://www.bbc.com/news/world-latin-america-26238612 . [v] Venezuelan opposition leader Lopez ‘to stay in custody, BBC News, 20/2/2014, http://www.bbc.com/news/world-latin-america-26263274 . This entry was posted on 27/03/2014 by ISIS Europe in Contributors, Opinions and tagged anti-Chavism, caracas protests, Henrique Capriles, hugo chavez, leopoldo lopez, María Corina Machado, Nicolás Maduro, socialism in venezuela, venezuela, venezuela protests.